The Latin name Christia means Follower of Christ. This monster has the same ATK and DEF as Archlord Zerato and its counterparts. Both Archlord Kristya and Archlord Zerato have the same red sashes. In the OCG, this card is the only card that was printed only in Gold Rare without any previously released counterpart from a Booster Pack. This monster appears in the artwork of Celestial Rage. 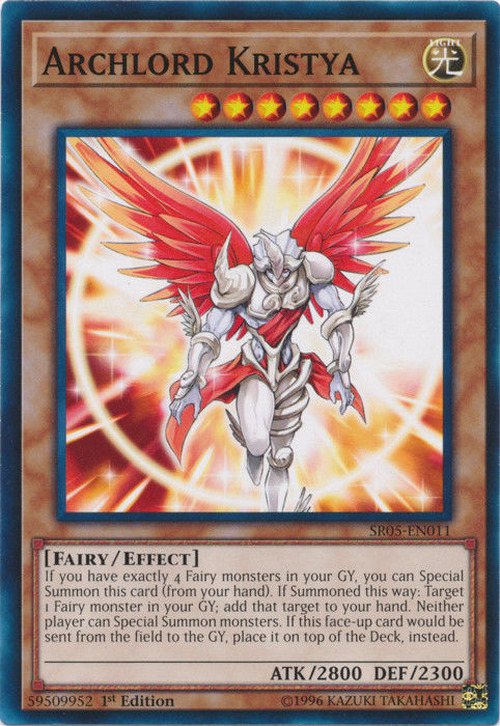 The effect to add a Fairy-Type monster to your hand targets 1 Fairy-Type monster in your Graveyard. If "Archlord Kristya" is sent to the Graveyard face-down, its effect to return to the top of the Deck is not applied. If "Macro Cosmos" is active and your face-up "Archlord Kristya" would be sent from the field to the Graveyard, it will still return to the top of the owner's Deck. If "Archlord Kristya" is destroyed by battle while "Grave Protector" is face-up on the field the effect of "Grave Protector" will apply and Kristya will be shuffled back into the Deck. If "Archlord Kristya" is destroyed by battle with "Dark Magician of Chaos" it will be removed from play instead of returning to the Deck. If "Skill Drain" is active, the effect to return "Archlord Kristya" to the Deck will not apply. If "Archlord Kristya" is equipped to "Relinquished" while face-up and then later destroyed it will return to the Deck. If "G.B. Hunter" is face-up on the field, "Archlord Kristya's" effect to return to the Deck will not be applied. Inherited Fortune:" You can activate “Inherited Fortune” even if you cannot Special Summon at the time, such as if you activated “Scapegoat” this turn or “Archlord Kristya” is on the field. The effect "Neither player can Special Summon monsters." is a Continuous Effect. "Bottomless Trap Hole": When resolving the effect of a "Bottomless Trap Hole" that was activated in response to the Normal Summon of "Archlord Kristya", "Archlord Kristya" cannot apply its effect, and it is destroyed and banished. : If "Bottomless Trap Hole" is activated when "Archlord Kristya" is Normal Summoned, is it banished? "Grave Protector": While the effect of "Grave Protector" is applying, any monster destroyed by battle is shuffled into the Deck instead of going to the Graveyard. If "Archlord Kristya" is destroyed by battle, since it would not be sent to the Graveyard, the effect "If this face-up card would be sent from the field to the Graveyard, place it on top of the Deck, instead." is not applied. Therefore, the "Archlord Kristya" that was destroyed by battle is shuffled into the Deck by the effect of "Grave Protector". : If "Archlord Kristya" is destroyed by battle while "Grave Protector" is face-up, is it returned to the top of the Deck? "Macro Cosmos": Even if "Archlord Kristya" would be sent from the field to the Graveyard while the effect of "Macro Cosmos" is applying, it is returned to the top of the Deck by its own effect. : If "Archlord Kristya" would be sent to the Graveyard while the effect of "Macro Cosmos" is applying, is it returned to the top of the Deck? "Mystical Beast of Serket": If "Archlord Kristya" is destroyed by battle with "Mystical Beast of Serket", then "Archlord Kristya" is not returned to the Deck and is banished by the effect of "Mystical Beast of Serket". : If "Archlord Kristya" is destroyed by battle with "Mystical Beast of Serket", is it banished? "Number 50: Blackship of Corn": A face-up "Archlord Kristya" can be targeted by the effect of "Number 50: Blackship of Corn". If "Archlord Kristya" is targeted, it is returned to the top of the Deck instead of being sent to the Graveyard by the effect of "Number 50: Blackship of Corn", and the effect "inflict 1000 damage to your opponent." is not applied. : Can "Archlord Kristya" be targeted by the effect of "Number 50: Blackship of Corn"? "Relinquished": Even if "Archlord Kristya" would be sent from the field to the Graveyard while it is treated as an Equip Card by the effect of "Relinquished", "Destiny Hero - Plasma" etc., it is returned to the top of the Deck by its own effect. : If an "Archlord Kristya" that is treated as an Equip Card would be sent to the Graveyard, is it returned to the top of the Deck? "Sephylon, the Ultimate Timelord": If an "Archlord Kristya" you control that was Special Summoned by the effect "Sephylon, the Ultimate Timelord is destroyed by battle or card effect and would be sent from the field to the Graveyard, the effect "If this face-up card would be sent from the field to the Graveyard, place it on top of the Deck, instead." is still applied. ("Archlord Kristya" is returned to the top of the Deck instead of being sent to the Graveyard. ): If an "Archlord Kristya" that was Special Summoned by the effect "Sephylon, the Ultimate Timelord" would be sent to the Graveyard, is the effect of "Archlord Kristya" applied? "Skill Drain": While the effect of "Skill Drain" is applying, if a face-up "Archlord Kristya" you control is destroyed by battle or card effect and would be sent from the field to the Graveyard, the effect "If this face-up card would be sent from the field to the Graveyard, place it on top of the Deck, instead." is still applied. ("Archlord Kristya" is returned to the top of the Deck instead of being sent to the Graveyard. ): If "Archlord Kristya" would be sent to the Graveyard while the effect of "Skill Drain" is applying, is the effect of "Archlord Kristya" applied?